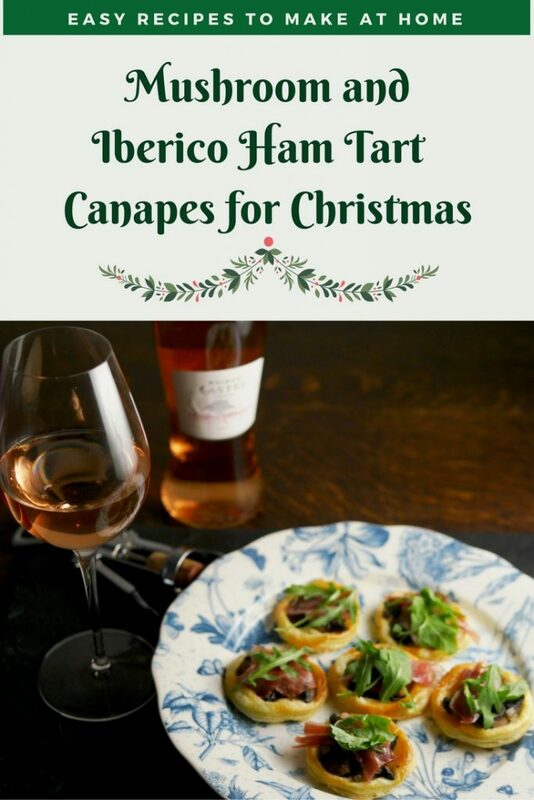 I’ve been cooking and tasting – using some of a precious stock of Iberico Ham which I am planning to serve at Christmas time. It’s a wonderfully nutty Jamón Ibérico de Bellota and I’m more than happy to just eat the slices with a glass of wine. In my opinion, it’s far too good to cook. But, it’s also something which needs to be served at room temperature and is quite rich, yet delicate. Red wine can easily overwhelm the delicate earthy notes and white wine never seems quite right to me. Hence trying it with a Rosé, albeit one from France, not Spain. In an attempt to make a little go a long way, I’ve been using it to make mushroom tarts with ham. Not cooking the ham, but adding morsels to a warm mushroom tart as a topping. And, the result is quite delicious. The warmth of the tart helps to soften the fat and bring out the flavours of the ham. But, could I find a Rosé to pair with my creation? 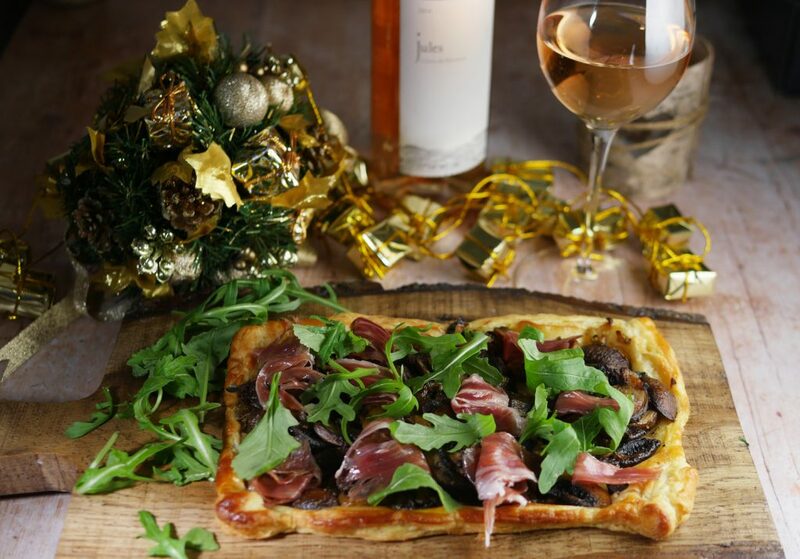 First, here’s the recipe for my mixed mushroom tart with Ibérico ham. It’s the perfect dish to make for the festive season. You can cook up a whole batch of mushrooms and keep them in the fridge in an airtight container for a few days. Then, all you need is a pack of good quality all-butter puff pastry, an egg to glaze and, of course, some Ibérico ham. 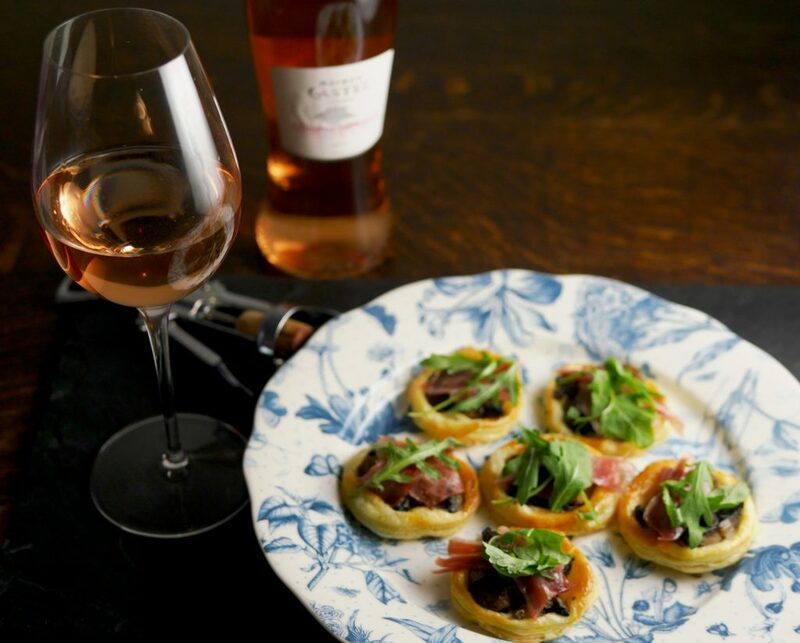 And, depending on the occasion you can make a mushroom and ham tart that works just as well as a light supper dish, as individual starters or as Canapés – all washed down with a glass of Rosé of course. Melt the butter in a large frying pan and saute the onion till soft and translucent. Remove from the pan. Saute the mushroom gently in batches if necessary, seasoning with pepper and cumin and a small amount of salt. They should be soft and barely cooked through. Roll out into an oblong. If you are making a single tart, all you need to do now is roll up the edges and brush them lightly with beaten egg. 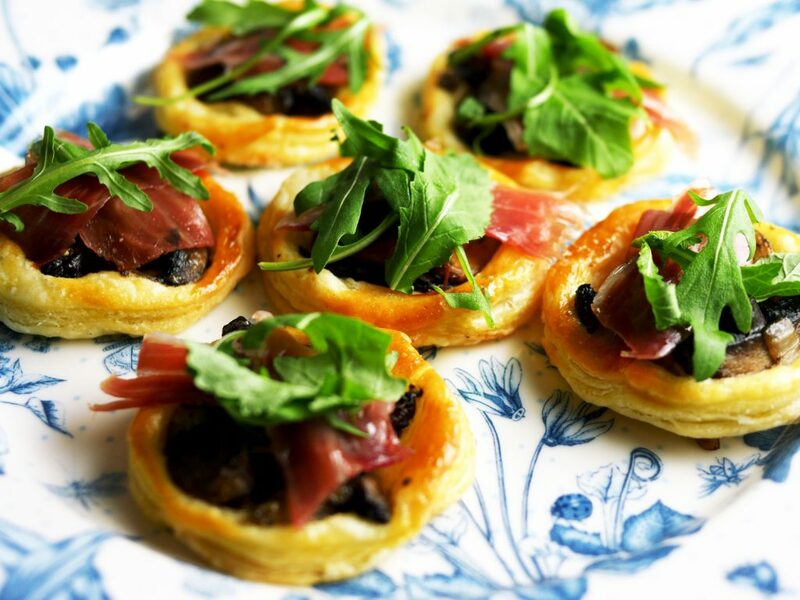 While the tarts are still piping hot, top each canape with a morsel of ham and a few rocket leaves. 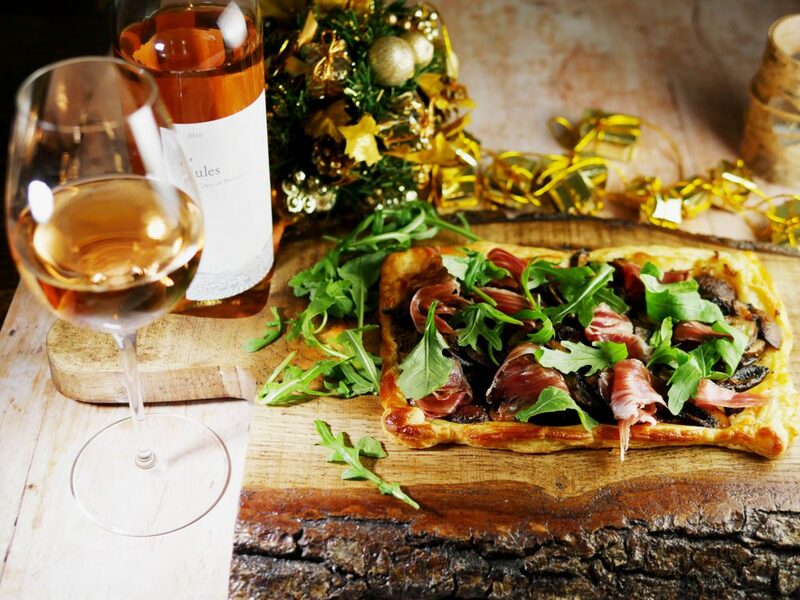 If you are making one rustic tart, scatter the ham and rocket across the tart. You can make and bake the canapes or tart in advance and just warm through in the oven when your guests arrive. Do not add the ham and rocket in advance as you will not be able to re-heat. On to the wines. About 85% of Côtes de Provence’s output is Rosé, traditionally made from a blend of at least two red grape varieties – for example, Grenache, Syrah, Mourvedre, Tibouren and Cinsaut. And, most Rosé from Provence gets that delicate pink colour by being made using a traditional direct press method – that is, the fruit is pressed very soon after harvest with minimal skin contact (usually just a few hours). This method produces a wine of paler shade than other production methods such as ‘Saignée’ where the skins of the grapes are literally allowed to ‘bleed’ into the wine before being removed. The first wine I tried, Maison Castel, comes in a pretty, traditional Provencal slim waisted bottle. Pale and interesting this is a citrussy and fresh wine that I would have been happy to drink as an aperitif, but it also paired well with the canape version of my mushroom and Iberico ham tarts. The citrus notes helped cut through the beautifully fatty Iberico ham and lifted the earthy mushrooms. Delicious. Next, Jules, from Julian Faulkner’s family estate in the heart of Provence. Made with a blend of 70% Cinsault, 15% Tibouren, 15% Grenache this was softer and more elegant – the kind of wine you do want to drink with food. It paired well with the larger rustic mushroom and ham tart I made. 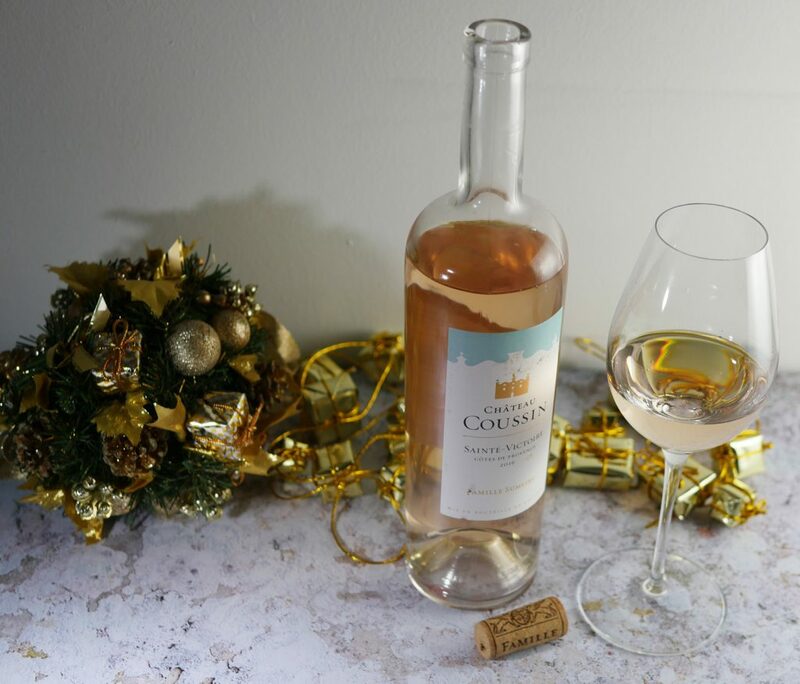 Perfect for a Christmas Eve supper, this wine has notes of red summer fruits and peach to complement the citrussy fruits and a good minerality. Finally, Château Coussin Rosé 2016, a blend of Cinsault, Grenache and Syrah. This is the most expensive of the three bottles and I’d recommend drinking it by itself first to get an understanding of the wine. It’s a very pale salmon pink, the lightest of the three. But, it’s also in many ways the fruitiest, with spicy red fruit notes. I’d recommend drinking this one not with my own recipe but with the turkey on Christmas Day – it’s more delicate and expressive than most red wines, light and citrussy But, it’s also robust enough with grapefruit, passion fruit and strawberry notes to work well with a festive turkey dinner. So why not? All in, I hope I’ve demonstrated that Rosé wines from Provence will pair just as well with winter dishes as with a summer Barbecue. Disclosure – I was sent samples of wine and have been paid a fee to cover my expenses developing this recipe. All content is editorially given. Just wonderful recipes oh and the wine sounds ?? I sure would like to try them all…Thank you ? This looks and sounds divine, and like the perfect dinner party starter! You have me now planning a small dinner party to sample paired wines with this! One question for you, I’m not a big fan of cumin, though I know others are. Can you recommend a substitute spice that would work well?